BOOK NOW YOUR HOTEL IN SALINA, HERE YOU CAN FIND THE BEST OFFERS! CLICK HERE! Salina is located north-west of Lipari and it is the second biggest and most popolous island of the Aeolian Archipelago, after Lipari. The island counts around 2.200 inhabitants and it is made up of three municipalities: Santa Marina, in the eastern coast; Leni, up in the hills and Malfa, on the northern area. The name comes from the abundance of saltpans once located in the south-east area of the island. Salina, like the others Aeolian Islands, has a vulcanic origin and there are two volcanic cones: Mount Fossa delle Felci (962 metres high a.s.l. and highest summit of all the Aeolian islands) and Mount Porri (859 metres a.s.l.) connected by a mountain pass. The villages are linked by bus service till late evening. In Salina there are six volcanos, whose last eruption dates back to 13.000 years ago. 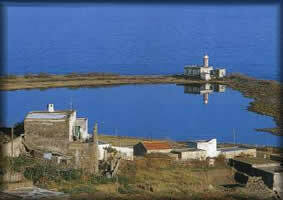 The main activities in Salina are the cultivation of grapes, oil, capers. Salina is the home of the well-known white wine Malvasia. The original name of Salina was "Didyme" (twins) and comes from the two volcanos presents in its territory. In its history, Salina enjoyed flourishing periods as well as periods of total neglect: i. e. during II century B.C., Salina was very populated, because of volcanos eruption in Lipari. Its history dates back to Bronze Age (evidences were found in Sciara Portella and Serra dei Cionfi). In the area of Serra dell'Acqua there were traces of an establishment of the VI-V century B.C. 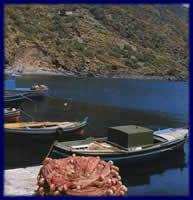 The traditional cuisine of Salina is based on fish and enriched with capers and olives. Traditional dishes are "spaghetti with olives and capers" with three particular kind of olives, local capers, garlic and pepper; roasted squids; "linguine al cartoccio" with sauce with mussels, clams and tomato: the dish is rolled up in silverpaper like a candy. Typical products are Malvasia, a dessert wine very aromatic and capers.